Allison Ray inks her contract surrounded by friends and family members. Pictured standing from left to right are Michael Stevens, Thomas Bolling (Interlachen High School Principal) Ryan Taylor and Interlachen Head Girls Soccer Coach Ron Whitehurst. Seated are Kelly Huntley, Rebecca McClure, Allison and Angela Taylor. 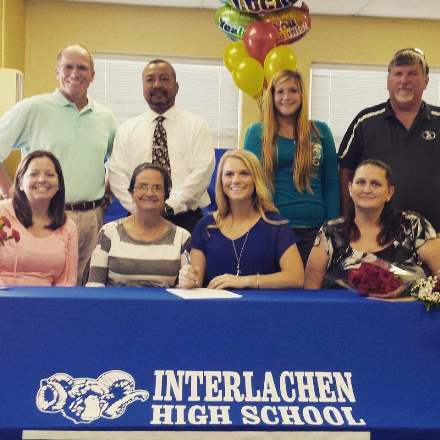 Allison is completing her senior year at Interlachen High School in Interlachen Florida. She is a four year varsity soccer player, a two year All-County selection and served as team captain. She will major in nursing at University of South Carolina Salkehatchie.